Harriett Arlene Lake, known as Ann Sothern (January 22, 1909 – March 15, 2001), was an American actress for nearly sixty years. Her career encompasses the Golden Age of Hollywood and Television. She also appeared on stage and over radio. Born in Valley City in Barnes County in southeastern North Dakota, but reared in Minneapolis, Minnesota, Sothern learned to play the piano as a young girl under the instruction of her Danish-born mother, Annette Yde Lake, who strongly encouraged her to become an actress. She attended the University of Washington at Seattle but dropped out after a year. The red-haired Sothern bleached her hair blond and began taking bit parts in motion pictures, beginng with Broadway Lights in 1927. In 1934, she was cast in the hit film, Kid Millions with Eddie Cantor. She appeared in ten MGM Pictures between 1939 and 1947 as the Brooklyn showgirl, Maisie Ravier. The role was originally intended for Jean Harlow, who died. She starred on-screen in two CBS television situation comedies, Private Secretary, 104 episodes from 1953 to 1957, and The Ann Sothern Show, 93 episodes from 1958 to 1961, both with Donald "Don" Porter (1912-1997). In 1965, she was cast in a voice role as Gladys Crabtree on thirty episodes of Jerry Van Dyke's fantasy comedy, My Mother the Car on NBC; the car was a 1928 Porter, coincidentally the name of her bosses in the two situation comedies. 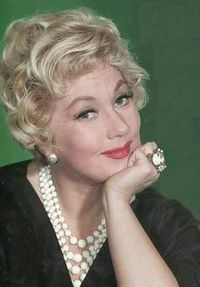 In 1965, she played Rosie Harrigan, the comical countess, in seven episodes of her friend Lucille Ball's The Lucy Show. In 1971, she appeared in the last season of NBC's western, The Virginian, in the episode "The Legacy of Spencer Flats", by which time the series was known as The Men from Shiloh. In 1987, she was nominated for an Academy Award for her role in the film The Whales of August. Sothern was a Republican. In the 1944 presidential election, she joined other celebrity Republicans at a rally in the Los Angeles Coliseum arranged by studio executive and producer David O. Selznick (1902-1965) in support of the Thomas Dewey-John W. Bricker ticket as well as Governor Earl Warren of California, who would be Dewey's running mate in 1948. The gathering drew 93,000, with Cecil B. DeMille as the master of ceremonies and short speeches by columnist Hedda Hopper and Walt Disney. An out-spoken anti-communist who supported the House Un-American Activities Committee hearings, the conservative Sothern supported all Republican presidents from Dwight Eisenhower to George W. Bush. She attended several Republican National Conventions. Sothern was twice married; the marriages ended in divorce after a few years. From the second marriage to actor Robert Sterling (1917-2006), she had a daughter in 1944, actress Tisha Sterling. In her last years, Sothern resided in Ketchum, Idaho, where the author Ernest Hemingway committed suicide in 1961. Her daughter and granddaughter lived nearby. Like Hemenway, she is interred at Ketchum Cemetery. Sothern was a convert to Roman Catholicism. ↑ 1.0 1.1 1.2 1.3 Ann Sothern biography. Internet Movie Data Base. Retrieved on April 11, 2018. ↑ David M. Jordan, FDR, Dewey, and the Election of 1944 (Bloomington and Indianapolis: Indiana University Press, 2011), p. 231. This page was last modified on 26 September 2018, at 08:20.